With automatic transmissions leading the way in car sales to the detriment of manual gearboxes, the thought of a manual-only option for a hatchback would appear questionable. Not to Kia, whose latest micro-model, the Picanto, has just added a hero GT version to its list. 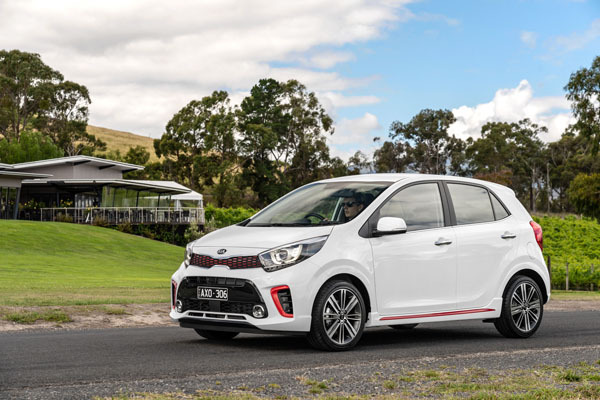 “We were warned that trying to launch a micro car into Australia was a fruitless exercise and doomed to failure,” Kia Motors Australia chief operating officer Damien Meredith says. “The segment was shrinking fast with only a handful of cars being sold. 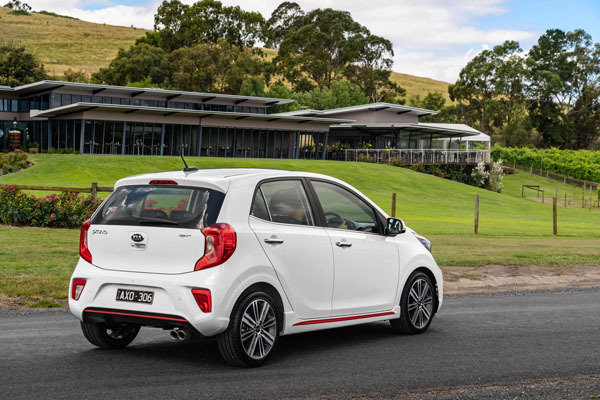 With that in mind, for the new Picanto GT, Kia called on a five-speed manual and hooked it up to a 1.0-litre turbocharged engine that develops 74 kW at 4500 rpm, and 171 Nm of torque between 1500 and 4000 rpm. All this is achieved thanks to a number of innovative technical solutions, including laser-drilled injectors with six holes in a pyramid shape so the fine mist of fuel is spread evenly throughout the cylinders and a straight air intake port ending in a sharp throat, reducing air resistance at all stages of the process. Combined urban / highway cycle fuel consumption is put at 4.8 litres per 100km. It was during this drive that the benefit of a suspension tuned especially for Australia by Kia Motors Australia’s ride-and-handling team came to the fore. Through a more aggressive tune for the shock absorbers and a stiffer spring rate the team was able to provide greater body control with better road feedback as well as improved ride comfort. Meanwhile, changes to steering mapping give a quicker response and enhanced stability when under load. Lower profile 195/45 rubber on 16-inch alloy wheels improve both grip and assuredness when pushing the limit. The GT shares much that is good about the current generation Picanto, including the ultra-stiff body shell, composed of 44 per cent advanced high-strength steels, providing premium handling and comfort, as well as occupant safety. Extensive safety features include autonomous emergency braking, six airbags, ABS braking, electronic stability control, hill start assist, vehicle stability management, torque vectoring and forward collision warning. The Picanto range’s straight-backed stance means there is ample head room in the rear for average-size passengers and the ability to maximise the 255 litres of luggage space. This is easily increased to 1010 litres by folding the 60:40 seat backs. Ostensibly a five-seater, shoulder space out back is very limited, especially with three adult passengers abreast. Headrests are adjustable vertically, rare in this grade of vehicle. 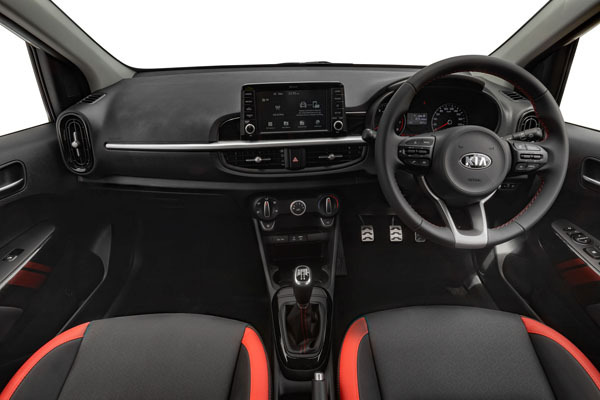 Picanto GT has Bluetooth connectivity, four-speaker audio system with Android Auto and Apple CarPlay, steering wheel-mounted audio controls, driver seat height adjustment, power windows front and rear with auto-up on driver’s window. The GT has its own character on the outside with contrasting body accents, twin exhaust, a body kit and GT badge. It is available in Clear White and premium colours Titanium Silver, Aurora Black and Signal Red. As well as sharp looks, the cost of Picanto GT ownership is a stand-out. At launch it can be driven out of the showroom for $17,990.